Engaging in a routine exercise program is challenging at any age. Exercising is tiring. We don’t want to spend the time. We’re feeling sore from yesterday’s workout. We have all made excuses like these for not working out; but frailty and advanced age make it even harder to stick with many types of exercise for elderly people. Self-confidence: It’s normal for seniors to feel overwhelmed with the idea of meeting exercise goals. It might help to begin slowly with exercises that can be accomplished and advance gradually; and, motivate the senior with regular support. Attitude: Attitude is everything when it comes to physical fitness. If approached adversely, it will likely be much harder to keep an effective exercise regime. Choose activities that’ll be enjoyable and that the senior can look forward to. Pain: The saying, “No pain, no gain” simply is not true. Older adults should avoid overdoing it, and reduce the amount of intensity if experiencing pain or discomfort. Disabilities: Older adults with physical or cognitive limitations can and should remain active within their ability level. Check with the physician for a referral to a personal trainer or physical therapist who can put together a program of specialized exercises. Fear of Injury/Balance Issues: You can find a number of assistive products to allow for safe, effective exercising. Financial Concerns: It doesn’t have to cost a lot of money to stay fit! Walking and other simple exercises in and around the house, using common household items, can be incorporated into an exercise program at little to no expense. Illness or Fatigue: Exercises may be tailored to match the senior’s energy level, and he or she may slowly increase endurance level with time. Keep in mind that the key to ongoing success with an exercise program is to ensure the older adult feels comfortable and safe with the program and the exercises. If soreness is noted in muscles or joints the following day after exercising, a reduced intensity can be implemented; and check with the doctor if the pain or discomfort persists. 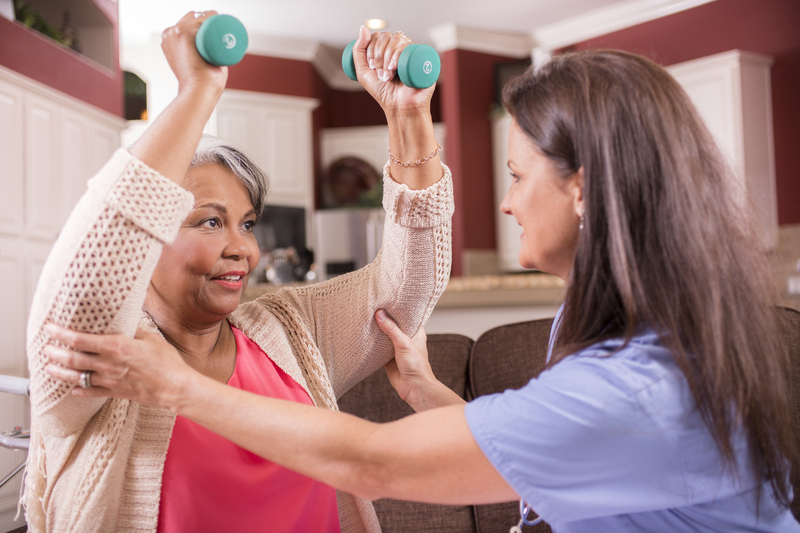 Visiting Angels Senior Homecare caregivers will work with your loved one’s doctor to develop a safe fitness plan based on his or her abilities to increase strength, independence, and general quality of life. Contact us online for more information about the advantages of daily exercise for elderly people and to find out more about how our in-home care services in California can help!